Competitive rates for MasterCard, Visa, American Express and Discover. See the monthly and per-transaction fees below. Per-transaction fees: We've teamed up with Bluefin to offer a flat-rate for all transactions of 2.99% + 10 cents/transaction. We don't offer "teaser rates" or "tiered pricing" because most transactions will end up costing you far more than you anticipated and the flat-rate we offer. Monthly fees: There is a required $12.95 monthly PCI compliance support fee which goes directly to providing you with a host of time-saving tools to minimize your PCI administrative burden. This fee is not being charged by Luminello. Yet even with this monthly fee, many of our users will save significantly over the likes of Square, PayPal or Stripe. Your first month's fee and minimum are waived so you can try things out risk-free! All Credit card processing accounts have interchange and card association fees. These are very minimal fees amounting to 1% or less of your monthly sales volume and will be reflected. Non-flat rates are highly variable, as it depends on what types of credit cards patients use (frequent flier miles cards, corporate cards vs debit or non-rewards cards). Many airlines cards, even swiped, would carry rates over 3%. Non-flat rate cards also have additional MC/Visa/Amex assessments tacked on (buried in the contract you sign) that can add up to 0.25-0.5% more that we include in the flat rate. Credit card info is saved, so you don't have to swipe or re-enter. Just "set it and forget it." You can save credit card info in Billing>Credit cards, or patients/clients can enter their own credit card number in their portal, thereby significantly reducing your PCI compliance burden (premium subscribers only). 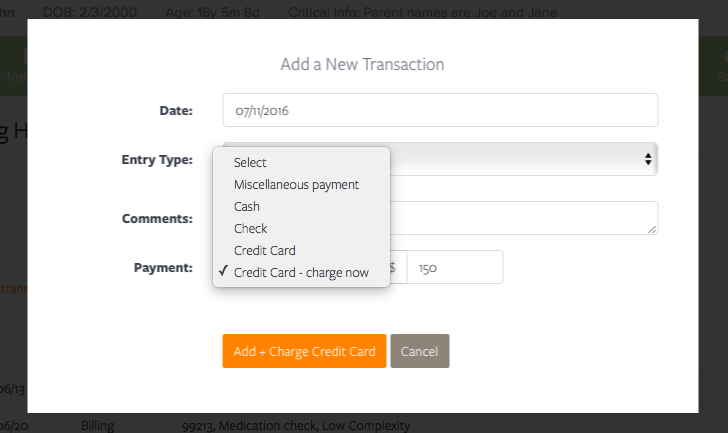 Once a card is saved, you can run or pre-authorize credit card transactions from the "Add transaction" screen. You can also run credit card transactions in the accounts receivable area. This allows for "rapid fire" end-of-month billing! Billing>history is automatically updated. No double entry! PCI compliance is the "HIPAA of the financial world" - these are security requirements EVERY merchant must meet to avoid huge fines and responsibility for breached credit card info (think Home Depot, Target, etc.). With the monthly PCI compliance support fee, you will have access to Trustwave services, which includes walking you through the annual PCI "quiz" and scanning of your computer if needed. If you have PCI compliance questions, you can talk to a specialist who can answer your questions. Even if you take PayPal, Square, or Stripe, you still need to be PCI compliant - but they don't provide any support for that process. We are committed to relieving this burden for every provider so you are not held responsible in case of a data breach! 1. Start your Bluefin application in Financial > Credit Cards, OR call Bluefin at 800-675-6573 x7802 and do the application over the phone. Note: per federal regulations, the following info will need to be sent to Bluefin. You can fax these to them, or take a picture on your phone and email it. 2. Bluefin will approve your application in 2-4 business days; then, we'll let you know you're good to go! Want to start saving time and accepting credit cards within Luminello? Sign up now». Billing and financial partners: who does what? How does customer service for credit card processing work?